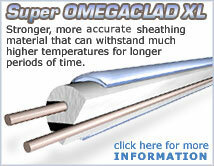 OMEGA Engineering offers a wide range of thermocouple wire in India. Metal Sheathed Thermocouple Wire is thermocouple wire that is surrounded by insulation material, typically magnesium oxide, and enclosed in a metal sheath. A key feature of this type of wire includes the ability to withstand vibration, high temperatures and pressures.